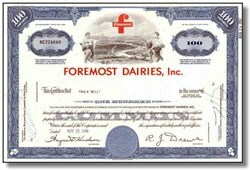 Beautifully engraved certificate from the Foremost Dairies Inc. issued the 1960's. 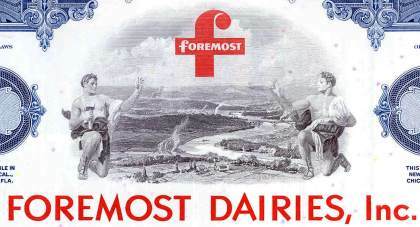 This historic document was printed by the American Banknote Company and has an ornate border around it with a vignette of two allegorical men flanking a picture a dairy farm with the company's logo in the sky. This item has the printed signatures of the Company�s President and Secretary and is over 38 years old. In 1967, Foremost and McKesson merged. At the time, Foremost-McKesson included chemical, liquor and pharmaceutical companies as well as Foremost Foods Company.